Alanya is a beautiful holiday centre with its beautiful sandy beaches, modern hotels and motels, as well as numerous fish restaurants, cafes, clubs and bars. The cafes that ring the harbour are popular gathering places for tourists and locals. From the towns lovely park, the road runs along the coast to the harbour, lined with many small shops that offer handicrafts, leather clothes, jewellery, handbags and the amusing painted gourds that are unique to the area. 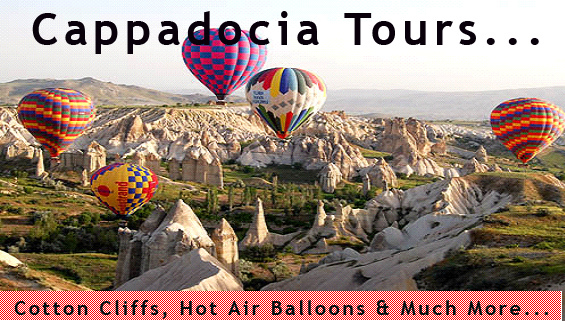 There are three blue flag beaches and many sights including Damlataş Cave, Archaeology and Ethnography Museum, Dim Çayı Valley, three see grottoes: Fosforlu Mağara, Kızlar Mağarası and Aşıklar Mağarası and many more. 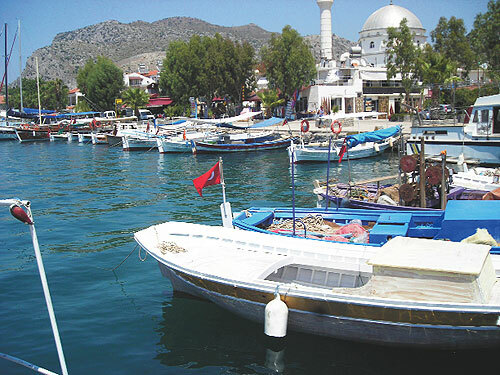 Attractions…The seaside villages, bays and coves of Bodrum, Gümbet, Bitez, Ortakent, Bağla, Aspat, Karaincir, Akyarlar, Turgutreis, Gümüşlük, Gümüşlük, Yalıkavak, Gündoğan, Gültürkbükü, Torba, Güllük, are world-famous, and each has its own charm and peculiarities. 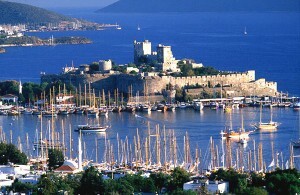 Bodrum Castle, built by The Knights of St. John, which has become a symbol of the peninsula. 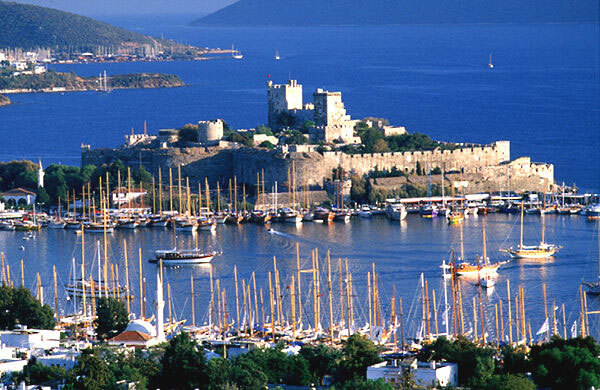 At present it hosts the Bodrum Museum of Underwater Archaeology which was awarded the “Certificate of Special Commendation” in the “European Museum of the Year Award” competition in 1995. 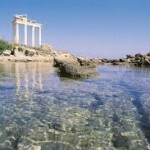 For the history enthusiast, another must see place in Bodrum is the remains of the Mausoleum. Blue Voyage: The Blue Voyage, also known as the Blue Cruise (“Mavi Yolculuk” in Turkish) is a term used for the recreational boating tours departing from Bodrum, Marmaris, Fethiye, Gökova, Fethiye and Antalya. These trips are a unique tranquil holidays to enjoy the beautiful bays and coves which can only be reached by sea, to swim in unpolluted waters in a myriad of shades of blue, to visit magnificent antique sites such as Knidos. The village of Göreme itself is at the heart of the area’s tourist industry, and many of its villagers still live in cave dwellings, some of which have been converted into pensions. 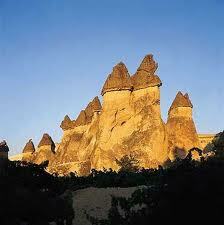 Surrounding the area are the amazing rock formations known evocatively as Peri Bacaları or ‘Fairy Chimneys’. Located to the west of Niğde, is the stunning Ihlara Vadisi, a gorge which is 10 km long and some 80 metres wide. Popular for trekking, about 12 of its 60 churches are open to the public including the impressive Eğritaş Church. Altinkum means ‘Golden Sands’ and it definitely offers this with the beautiful beaches of the tranquil Aegean sea. During the day you can spend time on one of the three gorgeous beaches; first beach is the main and largest of the three, offering a promenade of shops, bars, hotels and restaurants. Second beach is just to the left of the main beach, again with its own variety of bars and restaurants but much smaller. Third beach is at the opposite end towards the lunar park and is peaceful and quiet. Altinkum also has an array of hotels, and a beautiful newly built marina, attracting a lot of attention with its beautiful views. Didim and its nearby areas have lots to offer; staying within Altinkum there is a local market every Saturday where you can buy everything from the freshest of foods, to clothes, jewellery, accessories and much more. Its a good way to interact with the locals and test out your bargaining techniques. During the summer season there are daily boat trips, water sports, fishing trips and diving courses on offer. Not far from Altinkum you can experience the cultural world that is made up of trips to Lake Bafa, Miletos, Söke Market, Kusadasi, Bodrum, Ephesus, Pamukkale, Dalyan and many more. trips around the stunning coastline. 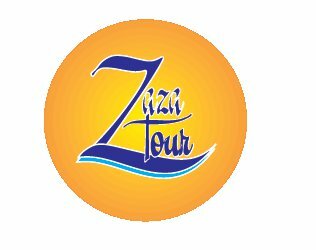 There are number of hotels in the town itself, which mostly attracts older couples, who enjoy the traditional lifestyle and also like the fact that it is flat and easy to get around. There is greater variety of shops in the narrow of the bazaar area, Paspatur. In the evenings, head for this lively area for live music and bars. Gocek: Göcek, a free motor traffic town, has numerous and beautiful coves, is the most popular spot for the yachts and Blue Cruise boats. 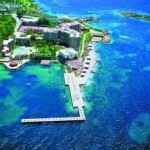 It is a meeting point for international celebrities and with its four marinas, small shops and retaurants. 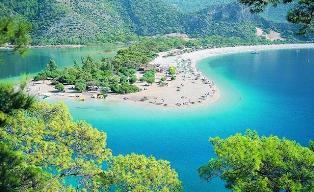 Oludeniz: Ölüdeniz has a typical postcard beach, backed by dramatic pine-clad hills. Literally translated as ‘dead sea’, the stunning lagoon is a protected area, ensuring that its natural beauty is preserved. There is a small entrance charge to use the lagoon beach and only non-motorised water sports are allowed on the lagoon itself. The main resort beach, which is free entry, is the long stretch of coarse sand and shingle, known as Belcekız beach. There is a strip alongside the seafront promenade with a number of relaxing bars, restaurants serving local and international cuisine and shops which stay open well into the night. It is a perfect family resort, great for a laid-back beach holiday, with plenty of facilities but not too much development. Boats leave from the bay for trips around the surrounding coast and paragliding is a big draw with the descent from the Babadağ mountains to land on Belcekız beach, recognised as one of the best in the world. 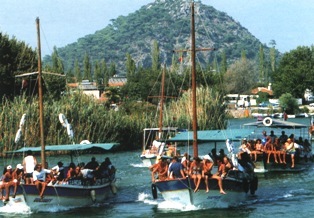 Ovacik & Hisaronu: Twenty years ago there was only few houses in Hisarönü bu now it is a lively resort in its own right. It is in a stunning location, surrounded by pine-clad montains, and hotels are built in the local style. 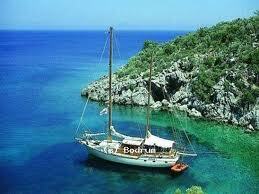 The beach of Ölüdeniz is just a 15 minute ride away. Just a short distance from Hisarönü, is the newer resort area of Ovacık, which is essentially a collection of hotelks and apartment buildings, blending in with the stunning mountain scenery. 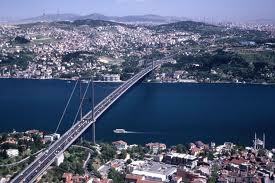 İstanbul is the only city in the world built on two continents. Its fate has been determined by its vital strategic location and enchanting natural beauty. It had long been coveted by powerful empires; it served as capital first to Byzantine, and then to the Ottoman Empire. İstanbul stretches along the two shores of the Bosphorus (İstanbul Strait) that links the Sea of Marmara with the Black Sea. 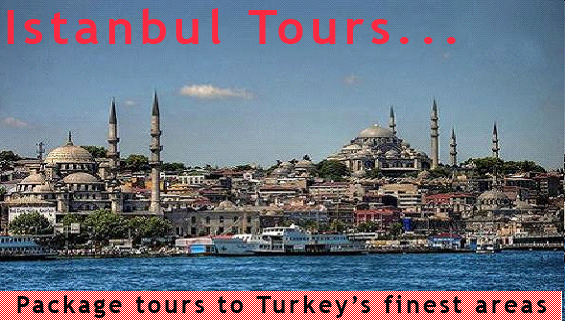 It is Turkey’s largest city with a population of approximately over 12 million. Istanbul is also at the heart of the economy of Turkey. The largest companies and banks, the media and advertising agencies all have their headquarters in this city. 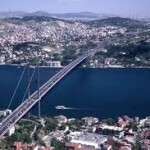 İstanbul is also the capital of art and culture with a rich tradition in opera and ballet, theatres, concerts, art exhibitions, festivals, auctions, conferences and of course unique museums. As an imperial capital for 1500 years, İstanbul has acquired a highly original personality. At every turn in the city you are faced with Roman, Byzantine and Ottoman palaces, mosques, churches, monasteries, monuments, walls and ruins. Yet İstanbul is not a city living only in its past. It is a vibrant, modern and future-oriented metropolis. Bazaars and ultra-modern shopping centres and department stores, street vendors and stock brokers, old crumbling buildings and skyscrapers coexist and this amalgam gives the city a multi-faceted outlook and flavour. İstanbul is like an intricately woven carpet, a subtle blend of eastern and western cultures. The city, known as “Beautiful İzmir” in Turkey, is located at the start of a long and narrow gulf, decorated with yachts, passenger ships and gulf steamers. 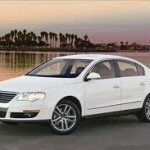 It has a warm climate and the cooling sea breeze in the summer takes away the burning heat of the sun. 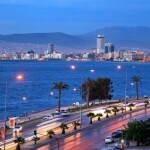 İzmir, which enjoys a special cultural and historical identity, is the third largest city in Turkey. Beaches and holiday resorts: 101 km of golden sands. 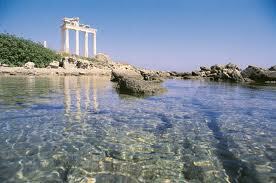 The Aegean coastal strip in the Province of Izmir runs for a length of 629 km. A 101 km section of this coastal strip is a natural beach. The geographical formation of Izmir’s coastal strip consisting of a peninsular and some small bays provide ideal opportunities for water sports as well as the use of a beach. The most popular beaches in the province include beaches at Pamucak, Altınkum, Gümüldür and Özdere in the south, Urla, Ceşme, Ilıca, Alaçatı in the east, as well as those at Dikili, Çandarlı, Foça, Ören in the north. Historic Sights: The cities of the Seven Churches of the Apocalypse, mentioned by St. John in the Book of Revelation, are found in Turkey. All of these world known ancient cities, Ephesus (Efes), Smyrna (İzmir), Pergamum (Bergama), Thyatira (Akhisar), Philadelphia (Alaşehir), Sardis (Sart) and Laodicea (Eskihisar) are within borders of İzmir except the last one which is in Denizli, an Aegean Interior city. 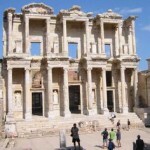 Ephesus (Efes) and Pergamum (Bergama), in particular, are the cities of ancient world that one should not miss to visit. In recent years, Kalkan has become an in spot for upmarket couples seeking a taste of authentic Turkey. It is a pretty village of stone-built houses set on a hillside around the attractive harbour. Narrow lanes lead down to the seafront, packed with shops, sophisticated bars and restaurants, mostly serving traditional Turkish fare, with some excellent seafood and fish restaurants on the harbour-front. The roads are steep so you need to be relatively fit to get around, but the hotels and villas set higher up on the hillside, benefit from stunning views down over the pretty bay. Due to the landscape there is simply no room for large-scale development so most of the hotels are small and intimate. The resort has expanded rapidly in recent years, however, and the buildings have extended beyond Kalkan itself to the bays on either side, such as Kalamar bay to the west – a long walk or a short taxi ride away from the centre. Most of the hotels on the seafront in this area and the ‘beaches’ have access to the sea via platforms or ladders, straight into deep water. Kalkan does have a small pebble town beach, but serious beach-lovers head out to stunning Kaputaş, approximately 6 km away, a fine pebble and shingle beach which has clear, stunning turquoise water. Others prefer the long stretch of sandy beach of Patara. 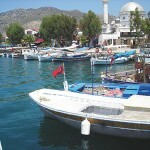 Boats leave from the harbour here and from nearby Kaş, approx. 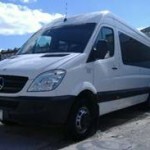 26 km away, for trips around the bays and to the surrounding islands. Kalkan has a unique ambience and is one of the most sophisticated of Turkey’s resorts, but is not recommended for those with difficulty in walking or for those with small children. 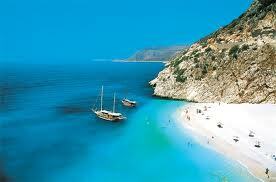 The ancient sites of Xanthos and Letoon are within easy reach of Kalkan. Kemer was one of Turkey’s first purpose built resorts, carefully planned to blend in with the surrounding scenery. At its heart is the attractive marina, a stopping-off point for yachts on the blue cruise. Around it are sophisticated shops, bars and restaurants catering for the resort’s well-heeled clientele. Kemer Beach is a clean pebble beach, but the main resort areas are on the beaches located a little further out, namely Kızıltepe, Göynük, Beldibi, Çamyuva and Tekirova. Surrounded by pine forests, they offer a range of accommodation including five star hotels, all designed to blend in to the natural environment. 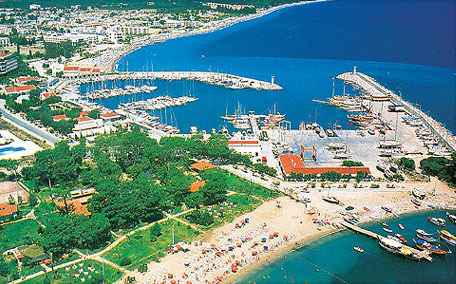 Kuşadası is one of Turkey’s largest and most cosmopolitan resorts and a stopping off point for the big cruise liners. It is a good all round resort, offering beautiful beaches, excellent shopping, great historic sights, and varieties of nightlife. Kuşadası literally means ‘Bird Island’ and takes its name from the tiny islet known as Güvercin Adası or Pigeon Island, which is attached to the mainland by a causeway and boasts a 14th century Genoese fort. The old town, having an Ottoman built traveller’s inn (Kervansaray) in its centre, is a popular shopping and entertainment area. 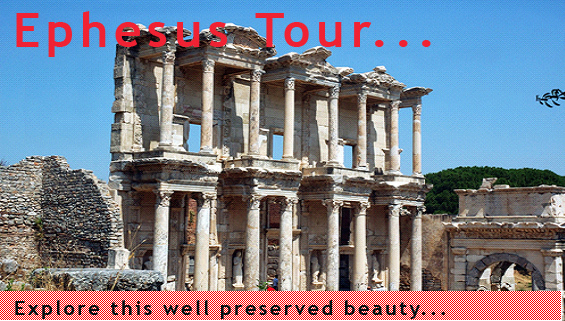 Antique cities of Ephesus, Miletos and Didyma, Virgin Mary’s House, St. John’s Basilica are world renowned historic sights near Kuşadası. Dilek Peninsula National Park in he south is another major touristic destination with its bewitching natural beauty with its trees, canyons, inlets, beaches, picnic areas, pathways. 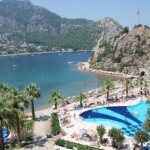 Marmaris is one of Turkey’s most popular resorts, which attracts lots of British holidaymakers, many of whom return year after year. 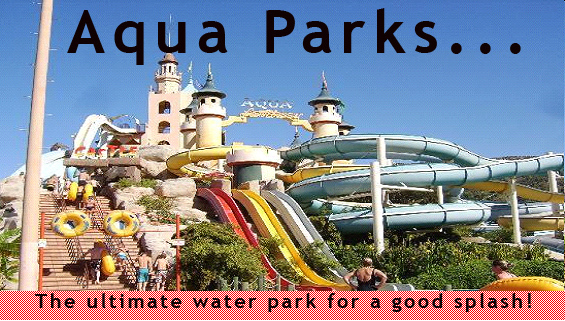 It is a favourite with families and young couples alike. It is in a stunning setting, its geography remarkably similar to that of the fjords, with pine-clad hills dropping steeply to the sea, jagged inlets and tiny rocky islets off the coast. There is a wide choice of accommodation, from five star luxury to self-catering apartments, but the vast majority is of three star standard. Most of the accommodation is built on either side of the main seafront road, some is on the seafront itself, but many of the newer hotels are on the hillside in areas such as Armutalan. There are many water sports centres in Marmaris or at the coves, ready to assist you in surface or underwater sports adventures – including extreme sports. Akvaryum (Aquarium) Cove, Baca (Chimney) Sea Cave and reef area are the fascinating diving spots for domestic and foreign visitors. 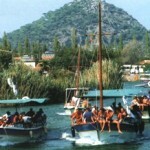 Nature and adventure sports such as rafting on Dalaman Stream, and trekking tours are organised by travel agencies. Jeep Safari is yet another alternative. Some of the sites of ancient cities in the environs of Marmaris are as follows: Amos (Hisaronii-Turung), Bybassos (Hisaronii), Kastabos (Hisaronu), Syma (Bayir Village), Larymna (Bozburun), Thyssanos (Sogiit), Phoinix (Tashca), Loryma (Bozukkale), Kasara (Serge Harbour), Cedrai (Sedir Island), Euthena and Amnistos.(Karacas6gut). Icemler: Içmeler is a popular resort with families. 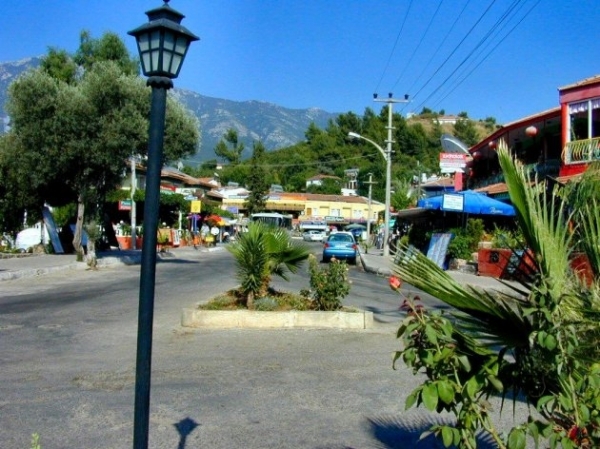 It is much greener than neighbouring Marmaris, with wide streets lined with threes and a relaxed ambiance. It nestles in the shelter of dramatic pine-clad mountains with a wide sweeping bay of coarse sand, where all kinds of water sports are available. The waters are shallow and calm making it relatively safe for children. There is an abundance of restaurants, serving a full range of Turkish and international cuisine, plenty of lively bars and lots of shops. 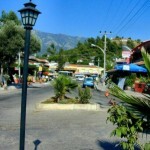 For those who want serious nightlife, Marmaris is just a short dolmuş or taxi ride away. Turunç: Turunç is reached by a steep, winding road, which snakes around the mountains from İçmeler, a sleepy resort, full of character. The accommodation here is mainly small family-run hotels, with some good self-catering properties. The main street has a good selection of restaurants with a few music bars, and enough shops to cater for your immediate holiday requirements. Bozburun: Bozburun has a stunning setting and is also famous for pine, flower and thyme honey. Its isolated location and peaceful atmosphere has attracted people escaping city life, and is especially popular with Turkish tourists. There are buses from Marmaris, 50km away, which makes a pleasant day trip, and there are many interesting walks in the surrounding countryside. The stunning white terraces of Pamukkale and the neighbouring site of Hierapolis are situated inland, close to the town of Denizli. They can be reached from most of the coastal resorts on a one day trip but Kuşadası is the closest – approximately 4 hours drive away. 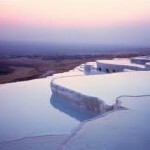 Pamukkale literally means ‘cotton castle’ and is one of Turkey’s most impressive natural wonders. 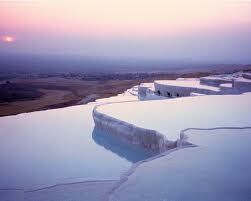 It is made up of a series of white travertine terraces cascading down a cliff, which is almost 200 metres high. The hard, white mineral deposits, which from a distance resemble snow, are caused by the high mineral content of the natural spring water which runs down the cliff and congregates in warm pools on the terraces. This is such a popular tourist attraction that strict rules had to be established in order to preserve its beauty, which include the fact that visitors may no longer walk on the terraces. Those who want to enjoy the thermal waters, however, can take a dip in the nearby pool, littered with fragments of marble pillars. It was the thermal waters which lead to the founding of the spa town of Hierapolis at the end of the 2nd century BC by the dynasty of the Attalids, the kings of Pergamon. 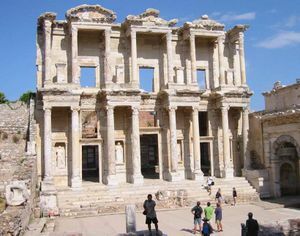 The remains include the ancient ruins of the baths, temples, the well-preserved theatre, and the largest necropolis or graveyard in Anatolia containing over 1200 tombs.